Published by Jorge Pinto Books New York. INTRODUCTION (AN OUTLINE FOR ART WORLD STUDIES) Art makes us perform. This is not a comment on how we become motivated to make performance art. Instead, I mean to say that the social environment constructed around art leads to a particular kind of conduct among those exposed to it. This conduct is manifested in formal and informal ways—ranging from conversations and subtle social interactions to formal presentations that can be academic or simply promotional; they can be merely intuitive or highly calculated. We make art in a particular social context, it becomes enveloped in an art world, and that, in turn, influences our behavior. So, to elaborate on my initial statement: artists make art that creates an art world that makes all of us who belong to that world perform. And, as we perform, we contribute to the construction of an art scene. 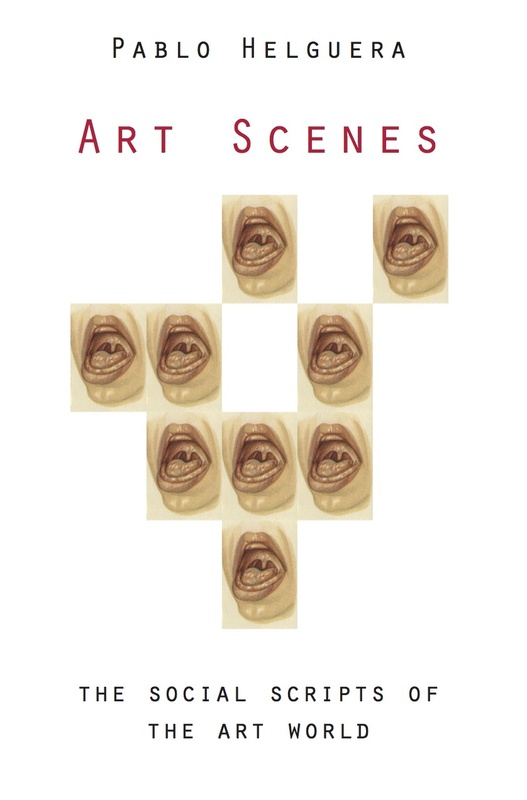 The main premise of this book is that contemporary art makes us perform self-conscious or instinctive interpretive acts; and that the construction of value in artworks is determined less by the objects themselves than by the nature of our interpretive performances, having a trickle-down effect on practically every aspect of art in society. This book aims to contribute in a small way to the neglected field of the sociology of contemporary art. The sociology of art has historically focused on the examination of how visual art becomes the expression of a particular historical period—that is, how art represents the ideas of the society that produced it. A less-studied subject is the sociology of today’s art world: how those who become invested in art also become both contributors to it and the social product of it and express themselves using its vocabulary. In the twenty-fi rst century, there is a developed, global, highly professionalized and vast cultural class that governs the way in which art is produced, interpreted, and disseminated. It is becoming more and more important to gain a better understanding of this loose social network that lives and communicates through the collectively constructed values it presents to the world. While art historians and academics study concrete periods of art or artists whose work enacts a social critique of their environment, they often shy away from the sociology of art itself. With the desire to explore that gap, starting in the mid-nineties I published articles—mostly of a satirical nature—commenting on the foibles and contradictions of the art world. This initial interest developed further as part of my work as a museum educator and organizer of public programs in various art institutions, where I observed and reflected on the behavior of both art professionals and amateurs. It eventually became apparent to me that what had, at first, seemed a curiosity was in fact a serious matter of study, as I began realizing how social dynamics condition our thinking and learning. This eventually drew me to socially engaged art and to the promotion of the creation of a new field of research that I have sometimes described as “art world studies.” This small book is the result of these ongoing reflections, and it is presented with the hope that it will help initiate a discussion about social behavior within the art world. Another goal for this project is to show that the default perspective from which the society of art is currently analyzed—namely, the financial angle—is very narrow. Although it may appear counterintuitive to some, this book departs from the belief that the art market’s role in the valuation process of art is actually dependent on social processes that are themselves not always dependent on the art market; which is another way of saying that, while the art market may have an impact on how certain kinds of art are valued, and while it can serve as a barometer of sorts regarding what kinds of art are gaining traction in certain circles, it generally functions more like an imperfect mirror of a priori processes of valuation that obey other forces, and it most definitely does not always represent, nor accurately reflect, the thoughts and interests of the art world as a whole. It most certainly does not account for the “non-economic” economy of art—which includes emerging fields and art supported by academic circuits, social and political organizations, nonprofit organizations, co-ops, educational institutions, individually funded art enterprises with very specific focuses, foundations, and government programs, among many others; nor does it represent art scenes in cities or countries that have scant or no commercial galleries, in places like the Middle East, Africa, South America, or Asia. It can’t absorb many of the new and important cross-disciplinary trends that actively dialogue with the vocabulary and concerns of contemporary art, which include technology, sciences, and the humanities, and that instead of producing objects tend to emphasize experiential works that are difficult to insert into the art market. And, last but not least, there is a growing group of artists all over the world whose work is specifically about creating alternative economies that counter the art market, finding other sources of sustainability— art microsystems designed specifically to not be co-opted by the conventional world of art fairs or galleries. In sum, there are vast numbers of artists and institutions globally that exist largely under the art market’s radar, that have little to no relationship to the world of galleries, and that produce and support art under very different circumstances and interests, a lot of which is eventually recognized by international exhibitions and publications. These many important developments in art most definitely are having an effect in the art market—for example, by inspiring market-friendly works by other artists—but to think that the art market is dictating or even documenting the development of these many other branches of art practice is misguided. Most of the time, the art market is a good barometer of nothing other than itself. There certainly is something very seductive about looking at the art world from the money side. The backdoor dealing, the veils of privacy, the issues of provenance and authenticity, the eccentricity shown in the purchase of dubious goods, as well as the sums of money that are exchanged and the colorful characters that participate in this world: in the hands of a good writer, these make for a juicy and entertaining read. This probably accounts for the popularity of books such as The $7 Million Stuffed Shark: The Curious Economics of Contemporary Art, by Don Thompson (Palgrave Macmillan, 2008), and Sarah Thornton’s Seven Days in the Art World (W. W. Norton & Co., 2009), both of which provide a glimpse into the inner dynamics of contemporary art society, mainly through economics—selling, collecting, and the status attained through those processes. The economics of the art world gets so much attention that there is a whole small industry of discussion circles around it. Art fairs regularly feature panel discussions about collecting, and magazines report on the subject regularly (not least because art fairs, galleries, auction houses, and the like are their main advertising clients). It is therefore not surprising that whenever the mainstream media reports on contemporary art, it usually tends to fixate on the market. Yet it is remarkable how little there is to say about the subject. The many panels on collecting tend to be indistinguishable from one another, as they often deal with recurring topics; art fairs and their events are extremely repetitive and usually inconsequential, mainly affi rming existing values. Perhaps the most important reason why the art market is not an accurate indicator of the process of valuation is that it is largely focused on (or, better said, invested in) the material object. Yet the art object is not what it used to be. Thanks to factors such as the huge proliferation of art, the endless supply and production—due to fast and cheap production technology—that result in vast collections of thousands of objects, and the influence of conceptualism, which has gradually made the original seem more or less expendable, the art world has come to resemble the fashion industry. In that sense, art objects, even when they are considered masterpieces, are, for better or worse, manipulated placeholders for the ideas and reputations of the characters of the art world—the artists, those who curate and collect their work, and others. I present this book out of my belief that in order to understand why certain ideas in art take precedence over others, there needs to be a better effort to grasp the way in which social, political, and philosophical concerns in the art of our time are negotiated in relation to the economic interests of the art world. In order to gain this better understanding, it is important to acknowledge that value in art is not an exclusive construct of the market, but the result of a complex web of debates that include political and theoretical exchanges, shifts in the historical moment, institutional and commercial promotion, and, of course, the emergence of thought-provoking art that pushes the discussion in a particular direction. The art world is a highly social environment that produces a close-knit network of art scenes (which I describe here as small performative environments), and it is essential to understand how those social interactions contribute to the negotiation among our different art values. The social interactions of this highly specialized world, which I will refer to as “social scripts,” are mostly conveyed through patterns of spoken communication and other subtle social codes, and they range in their degree of regimentation. As in much of society, the art world is surprisingly consistent; it follows set collective patterns of social exchange, as can be easily seen in the conventions that regulate the social events of most of its institutions— the art fair, the international biennial, the gallery environment, etc. These dynamics have been exacerbated by the growth of the art world into a professionalized arena with a seemingly never-endingly proliferating market of art and ideas. This unregulated proliferation is loosely managed by a network of tastemakers, in both academic and commercial areas of art, who reflect, exhibit, collect, and, mainly, communicate with each other to get a collective sense of what things are relevant to think about and how to respond to them. Most would agree that we have long abandoned the time when we saw art as part of an inevitable “evolution,” or as a relatively ordered debate around more or less established aesthetic and political opposites (Ingres vs. Delacroix, abstraction vs. representation, formalism vs. political art, etc.). The myriad forms, approaches, and styles of art today, as well as the overwhelming amount of work produced each day and the immediacy to which news of it comes to us, make it virtually impossible for us to think about art as we did even a few decades ago. Instead of maintaining the sense that we are participating in a historical continuum linked to the art of the past, we appear to participate in a loose threading of ever-fleeting present moments, one immediately contradicting the next. Even when a major biennial or exhibition opens, by the next day it belongs to the remote past and we are already thinking forward to the next defining event—even if that event will only be “defining” as fleetingly as the previous was. Our sense of existence within the art system closely relates to what Francisco de Quevedo once described as “presentes sucesiones de difunto”—present successions of dead people. In the art world, in our insatiable search for the new and the meaningful, we live among present successions of soon-to-be pass. art. Thrown as we are into an uncertain context that is too diverse, fluid, and varied to retain any semblance of cohesion, in making and discussing art we rely on our partial knowledge of present events, but increasingly we rely more on our intuition, on the collective assessments of those around us whose opinion we respect the most, and perhaps more importantly, on the social landscape against which a certain kind of art is starting to become meaningful (for example, when attending an exhibition where we already are somewhat familiar with some of the artists but not fully convinced of their worth, to encounter people we respect who are enthusiastic about the show can be a way to positively affirm our interest in it). This process is crucial because it lies at the core of what gives meaning to art today: the collective construction of value through agreement on taste and ideas, particularly among those who influence trends through their endorsement. Any understanding of the social dynamics of the art world needs to depart from this premise. I thus start this book by discussing value. It lies beyond the scope of this book to off er a sociological theory of the art world in any way. I openly admit that, not being an anthropologist or sociologist by training, the task of conducting a qualitative study to verify some of the observations made in this book exceeds my abilities. I do hope, however, that the observations that I have made over the course of many years in the fields of art, education, and performance and the interpretations and conclusions I provide may be of help to future research. I have attempted to provide a schematic sense of what characterizes these dynamics and how I perceive them to operate, with the hope that this may prove sufficient to persuade others to engage in further research into this subject. I would like to conclude with a few additional remarks: the book makes reference to the evolving role of the audience/ participant, as well as the problem of creating a true alternativity that could rewrite socially constructed paradigms in art. Yet, because the narrative focus of the book is more on the process of construction of value, and it’s not possible to elaborate on these other subjects, I felt it appropriate to add two earlier texts that address those subtopics in some way (see Appendices), the fi rst on how we could go about rethinking the “alternative” in art by placing greater emphasis on time rather than space (“Alternative Time and Instant Audience [The Public Program as an Alternative Space]”) and the second on how our performance should have sociolinguistic considerations (“Variations on an Audience”). Next, I imagine that some readers may interpret the main argument of this book to boil down to the simplistic point that we all are actors in society, and that art is only a reflection of that self-evident fact. My objective, however, is to indicate how this process of enacting responses to ideas and self-perceived relationships between oneself and others contributes to the construction of the social scores that ultimately create value and influence the course of events in art at a macroscopic scale. This construction of the performed “art scene” sets the primary framework for the creation of a society, and the study of this framework could be the basis and primary focus of the social anthropology of contemporary art, or art world studies. Last but not least, the approach taken in this book may generate the impression that my general argument, permeated by the analogy of theater, turns artworks into mere props and exhibition spaces into mere sets. It is certainly not my intention to minimize the relevance of the art object nor to overlook the importance of physical environments in the construction of value. Instead, it is my belief that if we are going to build a sociology of the contemporary art world, it can’t be centered on objects but on people and their social rituals around those objects. This is the message conveyed by most of the experimental works produced since the 1960s: if the art object has been slowly dematerializing, what takes its place is the social context around it. My hope is that gaining a better insight into why we perform as we do in relation to art can both help us develop a greater critical perspective on how we set our views about today’s art and also help us with the yet-unfinished modernist project of integrating art-making into other spheres of knowledge and experience.